Still deciding where to stay for St.Lucia Carnival 2KGreat? If you are in search of something fresh & unique, visit Tuxedo Villas. They offer tropical villas at hotel room prices. Click here for Villa Rates and Online Booking. 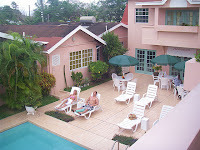 Located in the heart of the Rodney Bay Village, a stone throw away from the world famous Reduit Beach (25 ft.). We are within walking distance of restaurants, bars, gift shops and the mall. Plus: Each room has a full service kitchen. There is a restaurant on-site, available to host guest's events. Below are pictures, of the inside of a villa.